Fire safety awareness in north central B.C.’s First Nation communities got a boost this year, thanks to local and provincial service groups. 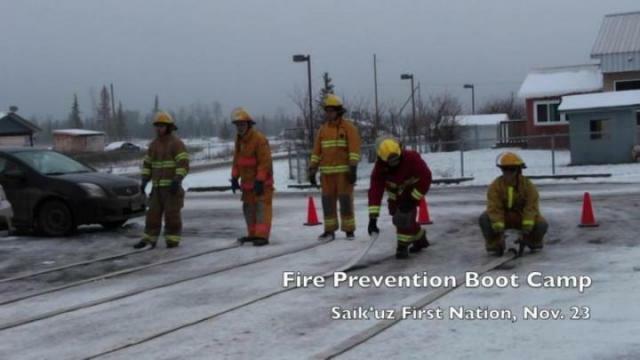 Donning firefighting gear and rolling hoses on the snow-covered ground of Saik’uz First Nation, about 20 students across the Nechako Lakes school district learned about fire safety, prevention, and response at the Fire Prevention Boot Camp on Nov. 22 and 23. Participants, ranging from grades 10 to 12, learned about emergency tools such as home escape plans and fire extinguishers, as well as performed firefighting exercises such as room searching, locating a 200-lb. dummy and dragging it to safety, coupling and rolling hoses, and putting on gear as quickly as possible. District of Vanderhoof’s fire chief Ian Leslie used a digital fire prevention animation tool to provide students with fire extinguisher practice, and Shane Greelees of B.C. Wildfire Service in Vanderhoof’s fire zone explained careers and training in wildfire fighting. For Grade 10 student Joseph Barfoot of Vanderhoof, it was a fun opportunity to see the difficulties in firefighting. “You have to be fast at dressing up, and we see why as well,” Barfoot said. The participating students were identified by career coordinators in home and brick-and-mortar schools for their interest, and would receive work experience credit for the two-day course. First initiated by First Nations’ Emergency Services Society of British Columbia and taught by the society’s fire service officers Liz Wilson and Kynan O’Rourke, the boot camp is the third instalment of its kind in B.C. since its beginning last November, Wilson said. The first two camps took place at Seabird Island Band in Agassiz and Ahousaht First Nation, which is located 40 minutes by boat from Tofino. To complete the course, students are also required to present to friends and family their learning of fire safety — an opportunity to not only spread awareness, but also to test the students’ knowledge and public speaking skills, Wilson added. For Saik’uz fire chief Gilbert Vickers, who demonstrated firefighting skills with volunteer firefighters at the boot camp, fire prevention awareness is increasing at the community, with home inspections as well as smoke alarms and fire distinguishers added to homes this year. “Prevention is key, it’s best if I don’t need to go out on a call,” Vickers said, adding that the department is looking into an Internet dispatch system for service calls. Saik’uz currently has six trained volunteer firefighters, and recruitment is on-going. “The fire hall will belong to these guys in the future,” he said.